Soldiers are warriors who fight for pay and, as such, are comparative latecomers to the field of human conflict. The warrior may be as old as human society itself, born of its need to protect family, territory and possessions against the greed and envy of neighbours. When it was that men first learnt to turn their tools and weapons of the chase against each other we cannot now guess. Warfare of an endemic sort is a feature of tribal relations among the most primitive peoples surviving into our own age. But the purpose of such warfare is obscure and its conduct marked by little loss of life. About five thousand years ago, however, in those fertile areas of the world where men were simultaneously learning to fashion their implements from metal, to communicate in written symbols and to farm their land by co-operative effort, the nature of warfare underwent a functional change. Uniformly armed bodies of men obeying a common leadership came into being and began to fight in an organized and purposive manner. These earliest warrior types were foot soldiers – infantrymen, as we would call them today – armed with clubs, spears and daggers, but also with close -range missile weapons, javelins, slings and the short bow. It was with such weapons that the peasant and city militias of early Egypt, Sumeria and Assyria protected and extended their irrigated lands. Such armies were temporary, however, called together only when need arose, and narrow in their campaigning range, since means neither of transport nor supply were well enough developed to permit extensive expeditions of conquest. About 2000 B. C., however, warfare underwent a second revolution, as important as and more dramatic than the metallurgical revolution which had given man effective weapons. Somewhere on the southern fringes of the great steppe of Central Asia the horse was tamed for domestic use. Initially the driven horse – it was not yet robust enough to be ridden – fulfilled a merely auxiliary military role. But intense technological experimentation provided its masters, at some time around 1700 B. C., with the chariot. Light enough to be drawn across country, strong enough to withstand the stress and strain of a charge over rough ground, and stable enough to allow its passenger to handle missile weapons from its platform, it empowered its owner with almost irresistible force against pedestrian opponents. Charioteers literally carried all before them, so that soon after 1700 B. C. they had established ‘chariot empires’ around the whole temperate periphery of the steppe heartland – in the Nile Valley, Mesopotamia, Persia, northern India, northern China and Western Europe. But the chariot empires were to prove short-lived. The technology on which they were based consumed too large a proportion of the rare metals and skills available for their warrior classes to be anything but an aristocratic minority imposed on the subordinate populations they ruled. The dissemination of iron tools and weapons, which became available in abundance about 1000 B. C., returned military power to the peasantry and townspeople of the world’s fertile regions. Out of the warrior masses that this iron revolution brought into being the traditional agricultural empires – in Egypt, Assyria and China – were restored. At first their military- strength rested on the armies of foot soldiers that they deployed. But about 900 B. C. a new sort of warrior made his appearance. He was a man who derived his power from a fourth military revolution, that of the adaptation of the horse to riding. Selective breeding from chosen stallions out of prized mares probably underlay this ‘cavalry revolution’. But the first ridden horses, bred by the nomad peoples of the steppe, were still not strong enough in the back to endow their rider with the capacity for shock action that would make them masters of the battlefield. The steppe pony, though it would carry its master on a thousand raiding expeditions into the civilized world from 600 B. C. to 1500 A. D., was essentially no more than a mobile platform for the archery at which the nomad peoples became so adept. Of far wider military significance was the appearance of the ‘great horse’ which the warriors of the Persian empire developed from 600 B. C. onwards. Large and strong enough to bear an armoured man in the line of battle, its strength underpinned the power of the Persian empire throughout its heyday, endowed Alexander the Great and his Companions with the means by which they conquered the Persian emperor’s dominions, and assured the empire’s survival in its long years of struggle against Rome. The great horse and his armoured rider would dominate wide sectors of the civilized world until the application of effective firearms to warfare in the sixteenth century A. D. Between them they helped to preserve the Byzantine half of the Roman empire into the fifteenth century and to found the Christian successor states of its western regions on a secure basis. The Teutonic warriors who overran the West in the fifth century A. D. were foot soldiers in the old tradition. By the eighth century they had acquired the stirrup – instrument of a minor technical revolution in its own right – from the steppe nomads and were commonly riding to battle, armoured, on great horses. Out of that military development a whole social order was born in Western Europe, an order based on the social dominance of the peasantry by the armoured warriors who protected them. ‘Feudalism’ is the word historians have adopted to describe it, a word derived from the dual relation- ship sustained by the mounted warrior with those above and below him. From his overlord he held his land in ‘feu’, a contract which obliged him to come armed and mounted for war when called upon to do so. To his underlings he offered security against the depredations of other feudal warriors and defence from the attack of hostile outsiders – Vikings, Muslim invaders, steppe raiders – who sought to penetrate the boundaries of Christendom. As Christendom waxed in strength and self-confidence, its warriors heeded the call to carry their military prowess beyond its frontiers and against the enemies whom hitherto they had always met on the defensive. In the crusading era, from the eleventh to the fourteenth centuries, Christian knights rode against the Muslim rulers of the Holy Land and the pagan Slavs of Europe’s eastern boundary. During the thirteenth century the easternmost defenders of Christendom had a close call with the most formidable of the steppe nomad armies ever to threaten Europe, when Genghis Khan’s horde approached its southern gateway in Hungary. Already the rulers of the largest empire the world had yet known, the Mongols might have succeeded in extending its frontiers into the lands dominated by the riders of the great horse, had it not been for the death in 1241 of their king, Ogotai, at the critical moment. Armoured horsemen and steppe nomads alike were, however, approaching the term of their power precisely at the moment when it seemed at its most extensive. Within three hundred years of the fall of the Crusader Kingdoms in Palestine and the withdrawal of the Mongols from Central Europe, a fifth military revolution brought the long dominance of the horseman in warfare to an end. Gunpowder, which allowed the warrior to substitute chemical for muscular energy in the management of his weapons, had been discovered in China in the twelfth century and, independently, in Europe in the fourteenth. By the beginning of the sixteenth century, the development of both handguns and artillery had reached a stage which robbed horse and rider of their freedom to move unchallenged about the battlefield, and returned military dominance to the infantryman. Not only to the infantryman; it had long been a major element in the armoured horseman’s control of his fellow men that his tactical prowess allowed him to build and occupy fortified strong places. Artillery brought such knights’ castles crashing down by the hundred in the sixteenth century, subordinating their occupants to the will of the few dynastic rulers rich enough to own guns in quantity. In the place of these ruins, which now dotted the landscape of feudal Europe, the new rulers built frontier and civic fortresses which protected their domains against invasion and their richest urban centres against domestic rebellion. These fortifications were the handiwork of a new breed of military engineers, who built not by rule of thumb but on mathematical principles. Geometrical calculation made their ‘bastion forts’ death traps for infantry to attack unsupported; when artillery joined the assault, the strength of the defences and the scientific siting of their gun positions ensured that sieges, even if successfully concluded, were long and costly. The development of a step-by-step technique of offensive siege engineering gradually empowered assaulting armies with means to overcome such fortification systems. But, extended as that development was over nearly two centuries, the overall effect of scientific fortification engineering was to consolidate the territories of the successful dynastic states and entrench the power of the monarchies that ruled them. The spread of such fortification systems did not, however, prevent those monarchies from waging war. On the contrary; though fortifications reduced the room for manoeuvre in the border regions, their indirect enhancement of state power, particularly for the raising of revenue, allowed kings to finance armies which were bigger and better equipped than any seen in the West since the collapse of the Roman empire. Campaigns, in consequence, actually increased in duration and reach, and battles in scale and intensity, during the sixteenth and seventeenth centuries. The principal medium of such military effort, outside the fortified zones, was supplied, as we have seen, by infantry. Gunpowder had made the infantryman sovereign in warfare, so that infantry now became, in a commonly used chess analog- ‘the Queen of the battlefield’. In the early half of the gunpowder period, pikemen continued to complement the handgunner’s function. By the late seventeenth century, when the musketeer had acquired the bayonet, which made his firearm also an effective edged weapon, he took the field unsupported. Artillery was not yet mobile enough to keep pace on the field with the infantry’s movements; cavalry, though effective when opposing infantry already broken by fire, and indispensable in the pursuit, was too fragile an arm to risk against massed musketry. From the mid-sixteenth century onwards, therefore, European campaigning was dominated by the foot soldier. And, increasingly, he was the permanently employed servant of one royal master – a ‘regular’ soldier, armed and clothed in a uniform manner. The first such soldiers had appeared in numbers in the employ of the Spanish kings at the end of the fifteenth century. France and the Habsburg lands had been the next monarchies to establish large regular armies. By the end of the seventeenth century they were the distinctive mark of all kingdoms which aspired to great power status. The populations of regions too small, remote or poor to maintain armies of their own – Switzerland, Scotland, the Balkan borderlands – contributed to the new military labour market by furnishing mercenary regiments which were hired and maintained by the rich states on a regular basis. The model on which the bodies of regular infantry were based was still that of the old mercenary companies of the late Middle Ages, in that the tactical unit remained the company, commanded by a Captain, with a lieutenant and sergeant- major as his principal assistants. Under the new dispensation, however, the rule or ‘regiment’ of a Colonel, appointed by the King, was imposed on groups of companies for administrative purposes. These regiments, about a thousand men strong, became the principal instrument through which the European states settled their religious, dynastic and political differences from the seventeenth to the nineteenth century. Clad in white by the French and Habsburg Kings, red by the English, blue by the Prussian – an important newcomer to the European military scene – their long columns, swinging forward ten or fifteen miles a day in cadenced step to the rhythm of their regimental drums and fifes, emerged each campaigning season from winter quarters to manoeuvre against each other around Europe’s campaigning grounds and, when advantage promised or escape was denied, to form against each other in serried ranks and put the issue to the test of volley and bayonet charge. The primacy of the regular infantryman was somewhat diminished by the appearance of mobile battlefield artillery at the end of the eighteenth century. In the battles of the French Revolution and Empire, such artillery was frequently pushed forward to ranges at which massed infantry suffered grievously from its fire, allowing cavalry to exploit the damage done. Resolute infantry which kept its ranks closed nevertheless remained impervious to successful attack by any save its own kind. And when drilled infantry, transported by seapower to the world beyond Europe, met armies not yet schooled to its standards of discipline, the outcome of such exchanges was even more arresting. 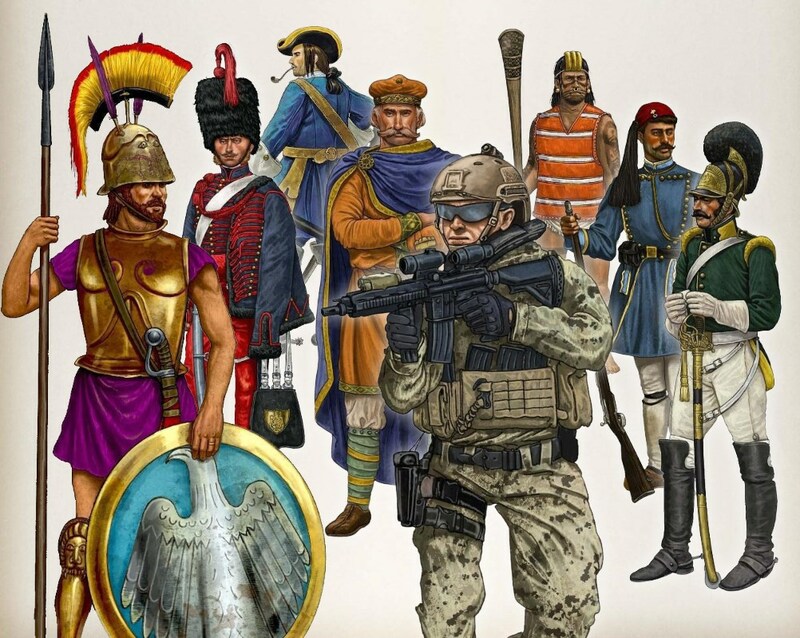 Quite tiny armies of Europeans proved able to devastate, for example, vast hosts of soldiers deployed by the Mogul emperors of India, with results that would transform the world balance of power. In the middle of the nineteenth century, however, the technological equilibrium which had endowed the European infantryman with his battle -winning capacity was suddenly upset. New firearms, rifled to enhance accuracy at unprecedented ranges and then furnished with a magazine to decuple firepower, rendered close- order infantry tactics not merely ineffective but dangerous and self-defeating. The character of the battles of the American Civil War, 1861-65, had issued that warning in stark terms. Those fought in Europe and in its dependencies during 1866-1913 repeated it in even more threatening form. By the end of the first decade ot the twentieth century it was clear to any dispassionate observer that the era of the primacy of man in warfare was drawing to a close and that the era of the primacy of the machine was at hand. Most professional observers were, however, not dispassionate. Despite the appearance of the machine-gun, which multiplied the firepower of an infantry regiment tenfold, of quick-firing artillery, which made mass tactics suicidal, and of the aeroplane, which immediately extended an army’s daily scouting range beyond that which cavalry could reach in a week, and promised an offensive effect of which only visionaries had hitherto dreamt, the traditional military mind clung to traditional military methods. Cavalrymen, recruited from descendants of or aspirants to the old feudal class, continued to insist that the mounted warrior was ultimately the deciding instrument of battle. Infantrymen argued that mass tactics provided the most rapid, and therefore the best, means of bringing issues in combat to a conclusion. Even gunners, whom their new weapons, if employed from a distance, endowed with battle -winning power, sought opportunities to engage the enemy at point-blank range, where their gun crews and teams were exposed to disabling counter-fire. In the teeth of a technological revolution, as it were, Europe’s professional soldiers sought to wage future war by the methods of the past rather than of the age to come. They, and those who obeyed their orders, were to pay a terrible price for this obscurantism. When war enfolded Europe in its grasp in August 1914, the huge regular armies of the combatant states – France, Germany, Russia and Austria each fielded armies several million strong and Britain promised to do so – beat each other into bloody immobility within three months of the outbreak. Overnight the military engineer, expert in the design and construction of fortified positions, resumed the place of importance he had held in his heyday; traditional fortresses had been overwhelmed in the opening moves of the war, but field entrenchments on a scale never before seen had appeared on all fronts and were to determine the nature of the fighting across them. The gunner, too, found his role enormously enhanced. The artilleries of all the armies began a vast expansion, particularly with howitzers of heavy calibres. Within two years of the war’s outbreak, it would be common practice to prepare infantry attacks with bombardments that consumed a million shells in a few days of fighting. Yet neither field engineering nor large-scale gunnery sufficed to solve the problem of the First World War; the former could not fully protect defending infantry from the latter, which in turn generally failed to break a way through for the attacker. Two years of heartbreaking trench fighting established those facts beyond doubt. New means and methods were needed to open the front. In the third year of the war they appeared, when the British army unveiled the tank and committed it to action with infantry trained to exploit the effect it created. From the outset, the tank aroused the strongest loyalties among tank men and excited revolutionary ideas about how it should be employed. Twice during the First World War, at Cambrai in 1917 and Amiens in 1918, sufficient numbers of tanks were made available for a mass armoured breakthrough to be essayed. In neither case was it wholly successful. The machine itself had not yet reached the stage of development at which it could achieve what was hoped for it. By 1939, however, its technical imperfections had been overcome and the German army in particular had reorganized its order of battle and rewritten its fighting doctrine to profit fully from the tank’s potentiality. The resulting strategy, to be hailed as ‘Blitzkrieg’ – lightning war – brought the Germans a whirlwind triumph in the West in 1940 and the Russian army to its knees in 1941. The machine age in warfare did indeed seem to promise victory almost without cost to the attacker who made the right technical choice and backed his judgement with deeds. The Germans reinforced their success on land with a brilliant and convergent effort from the air. The aeroplane had played a minor role in the First World War as an observation platform, protected by specialized fighting machines which occasionally flew ground attack missions in the later trench offensives. By 1939 the German air force was equipped with three thousand fighters and bombers of advanced performance, all designed to support the army’s tank units in offensive operations. Additionally, it deployed a large force of tactical transport aircraft, some dedicated to fly and drop its newly raised units of parachute assault infantry behind enemy lines. These parachutists, supplemented by glider-borne infantry, were to intervene in the 1940 campaign with spectacular effect against strongpoints in Belgium and Holland. Tanks, tactical aircraft, self-propelled artillery, motorized infantry; these elements of machine-age warfare were to invest its operations with the rapidity and reach not seen since the irruptions of Genghis Khan in the thirteenth century. And while the steppe horsemen merely slew and plundered, the behemoth armies of Blitzkrieg crushed all opposition they encountered, devastating the countryside over which they passed and laying waste the towns and cities that stood in their path. For the opening years of the Second World War, it seemed that armies organized on the Blitzkrieg principle were unstoppable and invincible, and that a total German victory was inevitable. But the pendulum swing of technical riposte then came into play. During the two years in which Germany’s tank and air forces had rampaged across the battlefields, the governments and industries of its surviving opponents had bent all efforts to replicating the armouries and organizations deployed against them. By 1942 Russia and Britain had raised large armoured and tactical air forces of their own, to which were then joined those furnished by the mighty and swelling industrial power of the United States. By 1943, the military balance of force in the world stood in equilibrium. Rapidly thereafter it swung the way of Germany’s enemies, whose output exceeded hers some six times. By 1945 British, American and Russian tank armies had broached her frontiers and stood on her soil, while her cities and industry crumbled under the weight of their strategic air attack. Germany, the inventor of Blitzkrieg, had in her turn been blitzkrieged, and, through the iron laws of attrition that the technique had been supposed to evade, reduced to humiliating and agonized defeat. Wartare had proved too crude and brutal a medium of human relationship to be revolutionized by mere technical ingenuity. Yet that did not mean that, in the post-war world, the search would not continue for military success without proportionate military outlay. The renaissance of irregular forces had been a noted feature of the Second World War – commandos, parachutists, long-range penetration units, subversive teams, guerrilla liaison units. The Western allies had suffused German-occupied Europe with irregulars of all sorts, while the Soviet Union had maintained large partisan units in the German rear in Russia. Both had encouraged and sustained guerrilla forces inside areas they could not immediately reach with their own regular units, as the British and Americans had also done in Japanese-occupied Asia. The rise of nationalist guerrilla movements in the remnants of the European colonial empires after 1945 – in Palestine, Indo-China, Malaysia, Algeria, Arabia, Southern Africa – prompted the states which had, as they believed, acquired expertise in irregular warfare against the Germans to mobilize the same technique against these revolutionary nationalists. The impulse to fight fire with fire was almost uniformly unsuccessful. The British Special Air Service achieved limited dominance over the weak Malayan guerrillas in remote areas, later to be repeated against Indonesian infiltrators in Borneo. The French founded and ran anti-nationalist guerrilla groups in Algeria and Indo- China, in the latter territory later to be reformed by the Americans. The Rhodesian army conducted deep penetration operations against African guerrilla bases lying beyond the country’s borders. But all. with allowance for some British success, eventually failed in staving off the inevitable. Elite forces, however dedicated and well-trained, lack the capacity to defeat guerrillas fighting on their own ground with the support, however obtained and sustained, of the local population. That is not to say that guerrilla warfare is what Clausewitz would have called ‘a stronger form’ than conventional war. On the contrary; despite much political propaganda and ill-informed journalism lauding the cunning and skill of guerrilla fighters in the ‘wars of national liberation’ which have been so widely fought since 1945, they have had success only when heavily supported by conventional forces, or when established authority was ripe for defeat, and then always through methods that inflicted appalling hardship and suffering on the civilian population caught between the millstones of rebellion and repression. Hardship and suffering are inseparable from the human experience of war; it is, indeed, war’s purpose that humanity should suffer, to the point when one side is unwilling or unable to sustain the strain. That strain is frequently offset by material and spiritual alleviations. War generates a sense of unity, of pride, of identity, of excitement. Its material demands often generate prosperity, at least in the short term, by mobilizing the resources of the combatants to the full, by stimulating state expenditure and by absorbing labour previously unemployed. But, in wars fought to a decisive conclusion, costs almost always outweigh benefits, and such costs are measured in death, wounds and profound personal suffering. Families and localities experience such suffering through the loss of those who do not return from the fighting. Soldiers experience that suffering directly. The fear of death is the soldier’s universal lot. So, too, is the fear of wounding, which, for soldiers of the ‘teeth arms’, is all too often realized; in the British infantry of the First World War, four out of every nine soldiers who reached the front became casualties. How he may be wounded and how he will be treated have, therefore, always preoccupied the soldier, for whom the quality of his army’s medical service has consequently been as important as that of his weapons or of his leadership. In some of the earliest military contracts that have come down to us, sworn between Greek mercenaries of the third century B. C. and their employers, the provision of adequate medical care ranked among the principal terms. Yet medical care, almost until our own century, could not be adequate. Surgery, advances in which were always stimulated by warfare, could repair simple, clean wounds. But battle wounds are frequently deep and complex and easily infected by contact with clothing and the soil; gangrene, for example, a common outcome of wounds suffered in the First World War, is the consequence of falling with an open wound on to tilled ground that has been fertilized with animal manure. Fatalities in a unit that had been in action were therefore often higher on the days following a battle than on the day of fighting itself, as those who had suffered wounds not immediately fatal succumbed to their after-effects. Not until disinfectants came into common use after 1850 did this pattern begin to reverse itself; while the real improvement in the prognosis of wound treatment had to await the introduction of antibiotics, blood transfusion and intensive resuscitation during the Second World War. And by then refinements in the nature of wounding agents, particularly those producing intense blast, burn and high fragmentation effect, were causing wounds graver than any with which military medical services had yet had to deal. ‘A Blighty One’ – the sort of simple, disabling wound which soldiers of the First World War had welcomed as an honourable passport off the battlefield – was becoming ever more elusive. How does the soldier, beset by the danger of death, fear of wounds and the greatly increased risk of succumbing to disease which membership of an army has entailed for most of military history, sustain his will to combat? Fighting spirit is the mood a commander strives most earnestly to generate and sustain in his army. Proper concern for his troops’ welfare, by provision of good and regular food, pay and comforts – what are called the ‘sinews of war’ – is one means to it. Exhortation is another; many great commanders have been noted orators, skilled in appealing to the pride, patriotism and loyalty of their men and calculating, too, in their promises of fame and material reward. Punishment, of course, always threatens the soldier who will not yield to such appeals; ‘pay well, command well, hang well’ was Sir Ralph Hopton’s summary of the seventeenth-century general’s art and hangmen or their equivalents have found their place in all the armies of history. But no general can afford to hang too extravagantly in the face of disobedience or cowardice; that will transform a bad army into a mutinous one. The wise general seeks, on the contrary, to make his men obey not because he makes them but because they so wish. And the most effective means of attaining that state of consent is by fostering among them bonds of loyalty and regard for each other too strong for the strains of battle to break. ‘Small group cohesion’ is what modern armies call this relationship. Whatever it is called, it has existed in good armies since the beginning of time. The hoplites of the Greek city-state militias took their place in the phalanx at the side of neighbours whose good opinion counted more strongly with them than fear of the enemy. The Roman legions made their smallest tactical unit the tentful of men who messed together throughout their service. In the mediaeval ‘lance’, neither knight, squire nor servant could flinch before the enemy without being damned for good in the eyes of the others. Regular armies made the platoon or company the unit of both of comradeship and firepower. And in the great conscript armies of our century, drafts of reservists have been trained together from the start of their service to foster that comradeship between them they will need to see them through the fires of combat. This ‘buddy system’, based, in the words of the American military theorist S. L. A. Marshall, on a man’s fear of losing ‘what he holds more dear than life itself, his reputation as a man among other men’, seems ultimately to be what armours the individual against the terrible experience of war. It is felt most strongly by those soldiers whose duty brings them closest to the point of danger – the infantryman, the cavalryman, in our own age the tank man. It sustains the gunner, the engineer, the airman when their missions bring them within the orbit of the enemy’s firepower. It motivates the humbler servants of the fighting soldier, who work the sinews of war, and are often as much in danger as those at the front. It is life blood to the irregular, whose isolation and exposure put him more permanently at risk than any other sort of soldier. Friends, Argentine recruits in the Falklands/Malvinas war (1982) fought without any payment. . The recruits received no monthly retribution. “The last romantic war”.